Other [Reproduction By] – Pinepoint Ltd. Released in the last third of 1979 [Sleeve notes written in August 1979]. Tracks A1, A2, B2 & B3 recorded in Stereo. Tracks A3 & B1 recorded in Binaural. Bearing in mind the success of our Death and Horror and Disaster sound effects discs, I thought it is time to explore the other end of the emotional spectrum. So for a change, instead of being scared out of your skin, why not stay in it and listen to a selection of sounds whose only function is to send you to sleep? 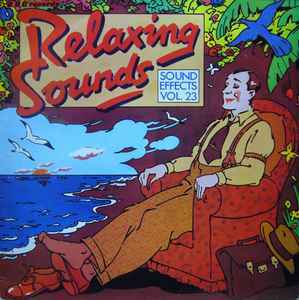 A relaxing sound can be many things tomany people and I have chosen six which I think will do the trick. They are all long in duration, to give you time to completely relax and drift away on a sea of sound. Two effects are musical and come from the BBC Radiophonic Workshop and the remaining four were recorded by Lloyd Silverthorne, a Sound Studio Manager whose main job is as a Field Research Worker, recording sound effects in binaural and stereo for use in radio Drama productions. For best listening conditions I would suggest a reclining armchair, a cup of something nice and try to listen on headphones - if you're not asleep by track 2 then I've failed and I'll go back to making the death and horror sounds! To get the very best from binaural sound it is necessary to listen to it on stereophonic headphones, but this does not preclude listening on speakers where binaural gives excellent results both in mono and stereo. Binaural differs from more usual stereo only in the type of microphones used, which are designed to mimic the human head, thus placing the headphone listener directly into the acoustic environment in which the recordings were made. The 'surround sound' image this achieves is especially suited to 'documentary' type sounds like the ones you will hear on this recording. When listening to normal stereo, the air between you and the loudspeakers is an essential part of the system. This is because the stereo illusion is created mostly by varying the volumes of sound in the two speakers and your brain converts this information into a time od arrival difference of the sound at your ears. To do this it is essential both ears each hear both speakers clearly. Binaural to a great extent does this conversion for you as the main directional information is now obtained by accurately recording the difference in time of arrival of the sounds at the two imaginary human ears of the binaural microphone. This means that you can listen directly to the recordings on headphones without the need for an 'air gap', and you can as well as hearing side to side movement hear sounds that apparently come from in front and behind your head.